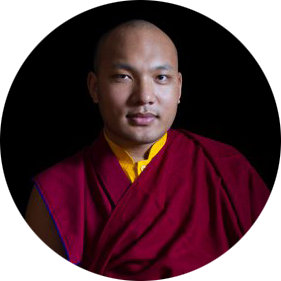 The Gyalwang Karmapa spent two –and- a- half days in Tibetan Children’s Village School (TCV) near Bir Tibetan settlement, Himachal Pradesh, at the invitation of TCV Suja School, who requested him to be Chief Guest at their 25th Anniversary celebrations. 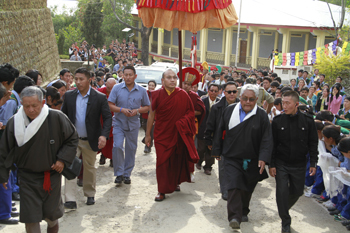 He was welcomed warmly with serbangs to TCV School by community leaders and the senior monks of local monasteries, before proceeding to TCV Suja School where staff and students gathered eagerly outside to greet him. On April 6th, His Holiness presided over the 25th anniversary ceremony, during which he gave a talk to the students. Mr. Thubten Lungrik, Education Kalon [cabinet minister] in the Tibetan government-in-exile and Mr. Tsewang Yeshi, President of TCV also spoke. Students and staff gave a performance of traditional Tibetan songs and dances. Later His Holiness visited the school exhibition, displaying the pupils’ work on Tibetan culture, Science, and Recycling and Environmental Protection. In the evening there were two competitions: Tibetan elocution and a quiz on the life of His Holiness the 14th Dalai Lama. On April 7th His Holiness gave the Manjushri empowerment. In addition to staff and students at the school, thousands of people, especially many senior citizens, came from Bir and other local settlements. His Holiness blessed everyone individually which took more than two hours.